"Sister cities" and "Twin town" redirect here. For the film, see Sister Cities (film). For other uses, see Twin town (disambiguation). 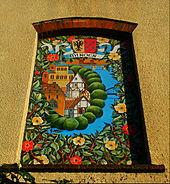 An example of a twinning agreement between Castellabate, Italy ('gemellaggio') and Blieskastel, Germany ('Partnerschaft'). In the United Kingdom, the term "twin towns" is most commonly used; the term "sister cities" is generally used for agreements with towns and cities in the Americas. In mainland Europe, the most commonly used terms are "twin towns", "partnership towns", "partner towns", and "friendship towns". The European Commission uses the term "twinned towns" and refers to the process as "town twinning". Spain uses the term "ciudades hermanadas", which means "sister cities". Germany, Poland, and the Czech Republic use Partnerstadt (De) / miasto partnerskie (Pl) / partnerské město (Cz), which translate as "partner town or city". France uses ville jumelée (twinned town or city), and Italy has gemellaggio (twinning) and comune gemellato (twinned municipality). In the Netherlands, the term is partnerstad or stedenband ("city bond", when providing mutual support). In Greece, the word αδελφοποίηση (adelfopiisi – fraternisation) has been adopted. In Iceland, the terms vinabæir (friend towns) and vinaborgir (friend cities) are used. In the former Soviet Bloc, "twin towns" and "twin cities" are used, along with города-побратимы (Ru) (sworn brother cities). The Americas, South Asia, and Australasia use the term "sister cities" or "twin cities". In China, the term is 友好城市 (yǒuhǎo chéngshì – friendship city). Sometimes, other government bodies enter into a twinning relationship, such as the agreement between the provinces of Hainan in China and Jeju-do in South Korea. The douzelage is a town twinning association with one town from each of the member states of the European Union. Despite the term often being used interchangeably, with the term "friendship city", this may mean a relationship with a more limited scope in comparison to a sister city relationship, and friendship city relationships are mayor-to-mayor agreements. For a more comprehensive list, see List of twin towns and sister cities in Europe. The practice was continued after the Second World War as a way to promote mutual understanding and cross-border projects of mutual benefit. For example, Coventry twinned with Stalingrad and later with Dresden as an act of peace and reconciliation, all three cities having been heavily bombed during the war. The City of Bath formed an "Alkmaar Adoption committee" in March 1945, when the Dutch city was still occupied by the German Army in the final months of the war, and children from each city took part in exchanges in 1945 and 1946. Similarly, in 1947, Bristol Corporation (later Bristol City Council) sent five 'leading citizens' on a goodwill mission to Hanover. Reading in 1947 was the first British town to form links with a former "enemy" city – Düsseldorf. The link still exists (Reading-Düsseldorf Association: http://www.reading-dusseldorf.org.uk/). Since 9 April 1956 Rome and Paris have been exclusively and reciprocally twinned with each other, following the motto: "Only Paris is worthy of Rome; only Rome is worthy of Paris." A recent study has concluded that geographical distance has very little, if any, influence upon communities' selections of a twin town. Twinned towns are often chosen because of similarities between them; thus about 15 towns in Wales are twinned with towns in Brittany, and Oxford is with Bonn, Leiden, Grenoble and other university cities. In Italy a good example of Twinnings is Rovigo with Viernheim, Bedford and Tulcea. Many former West German cities are twinned with former East German cities; these twinning links were established before the fall of the Iron Curtain. Famous examples are the partnerships of Hanover and Leipzig, both of which have important trade fair grounds, or between Hamburg and Dresden. The first US-German town twinning was in 1947 between Worthington, Minnesota and Crailsheim.St Petersburg in Russia holds the record for the largest number of partnership arrangements with other communities. In June 2012, the Scottish village of Dull and the US town of Boring, Oregon, agreed to twin their municipalities to promote tourism in both places, playing on their names. Recently some towns have made novelty twinning arrangements with fictional or virtual locations. Wincanton, England is partnered with Ankh-Morpork from Terry Pratchett's Discworld books. Town twinning has increasingly been used to form strategic international business links. For example, in the 1990s, when the Nottingham City Council in the UK considered installing a tram network, it consulted experts from its twin city of Karlsruhe, which has one of the most extensive and efficient tram networks in Germany. With assistance from Karlsruhe's specialist engineers, Nottingham completed its second tram line in 2013. In 2014, Bristol and New Orleans announced their intention to form a 'tuning' partnership based on a shared musical heritage and culture offer, at the initiative of Bristol Mayor George Ferguson. Annecy, France and Nerima, Tokyo have for several years shared a partnership based around their "co-existent animation industry". For a more comprehensive list, see List of twin towns and sister cities in North America. Toledo, Ohio twinned with Toledo, Spain in 1931 and was the first city in North America to engage in town twinning. Denver, Colorado twinned with Brest, France was the second twinned city in North America. Liberal, Kansas was twinned with Olney, Buckinghamshire in 1950, and the cities have run a joint Pancake Day race ever since. Littleton, CO twinned with Bega, Australia in 1961. Tashkent, the capital city of Uzbekistan, was twinned with Seattle, Washington in 1973. Rochester, Minnesota and Knebworth, UK are both centers for primary medical research, and they twinned in 1967. Town twinning begins for a variety of reasons. Generally, partner towns have similar demographics and size. They may arise from business connections, travel, similar industries, diaspora communities, or shared history. For example, the partnership between Portland, Oregon and Bologna, Italy arose from shared industries in biotechnology and education, and a "similar attitude towards food", whereas Chicago's link with Warsaw, Poland began with Chicago's historic Polish community. The twinning of Indianapolis with Monza, Italy is due to both cities' long association with auto racing. Mexico City is also one of Chicago's sister cities. A twin towns program was instituted in the United States in 1956 when President Dwight D. Eisenhower proposed a citizen diplomacy initiative. Sister Cities International (SCI) was originally a program of the National League of Cities, but it became a separate corporation in 1967 due to the growth and popularity of the program. Twin town cultural events include the annual National Cherry Blossom Festival in Washington, D.C. honoring Washington's twin relationship with Tokyo City. Many twinned towns developed business agreements with their partners. For example, Vermont's Ben & Jerry's Ice Cream company opened a factory in the Republic of Karelia in Russia and offered the same profit-sharing plan to its Russian employees. For a more comprehensive list, see List of twin towns and sister cities in Asia. 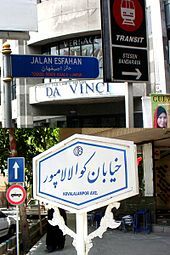 Isfahan Street in Kuala Lumpur (top) and Kuala Lumpur Avenue in Isfahan (bottom). Town twinning is supported in Japan by the Council of Local Authorities for International Relations, a joint agency of local governments established by the Japanese government in 1988 (similar to Sister Cities International, its counterpart in the US). More recently, Tokyo has begun to actively promote 'city diplomacy' with other global cities at the initiative of its governor Yoichi Masuzoe. Relationships between communities can also arise because of shared names; they may be named after one community (as in the case of Córdoba), they may share names (as in the case of Santiago de Compostela), or their names may have a common etymology. Road sign of Artieda de Aragón and Emiliano Zapata, an autonomous Zapatista municipality. These similarities usually arise from sharing the same or related language, or from having been a colony or previously conquered. Twinning towns and cities is sometimes done for political purposes. The Hungarian city Gyöngyös was twinned with the Azerbaijani city of Shusha in 2013, signing the twinning agreement with representatives from the Azerbaijani government; Hungary recognises Shusha as part of Azerbaijan, even though since the end of the Karabakh War it has been controlled by the military forces of Armenia and the unrecognised Artsakh (de jure part of Azerbaijan). An attempt was made in 2003 by Preston city councillors in England to twin with the Palestinian town of Nablus in the name of solidarity. In 2012, the city of Nanjing suspended their sister city relationship with Nagoya after Nanking Massacre denialist statements by Nagoya's mayor, Takashi Kawamura. In 2013, the Italian cities of Milan, Venice, and Turin, formerly twinned with Saint Petersburg, suspended their links due to Russia's passage of anti-gay legislation. Activists in California circulated petitions urging California cities and counties with relationships with Russian counterparts to take similar steps. In 2014, Prague terminated its partnership with Saint Petersburg and Moscow because of the Russian military intervention in Ukraine. Moscow had been Prague's partner city since 1995. In 2017, the mayor of Osaka, Hirofumi Yoshimura, ended the city's 60-year relationship with San Francisco due to the erection of a memorial to comfort women in downtown San Francisco. 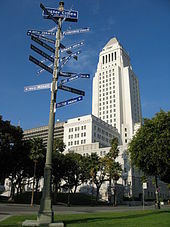 Similarly, the cities of Glendale, California and Higashiosaka, Japan came close to terminating their twinning in 2013 and 2014 because of an ongoing dispute over Glendale's support for the erection of a statue dedicated to Korean comfort women in a city park. ^ a b c d e f g h i j Clarke, N. "Town Twinning in Britain since 1945: A Summary of findings" (PDF). School of Geography, University of Southampton. Archived from the original (PDF) on 29 July 2013. Retrieved 29 July 2013. ^ a b c d "The Origins of Town Twinning" (PDF). Inverness: The City of Inverness Town Twinning Committee. 8 December 2008. Archived from the original (PDF) on 31 December 2010. Retrieved 30 October 2009. ^ "What is town twinning?". L'Association des Communes Jumelées du Limousin. Archived from the original on 5 September 2013. Retrieved 5 September 2013. ^ a b Brown, Tom (31 July 2013). "Twin towns: Do we still need them?". BBC East Midlands Today. BBC News. Retrieved 7 August 2013. ^ a b "Action 1 – Measure 1: Town Twinning". The Education, Audiovisual and Culture Executive Agency (EACEA). Retrieved 26 August 2013. ^ "Mogilev: Twin Towns – Twin Cities". Mogilev city executive committee. Retrieved 19 October 2013. ^ "Tbilisi, Vilnius become brother cities". Trend News Agency. Retrieved 12 October 2009. ^ Self-Pierson, Rob (30 April 2012). "Is there a point to twin towns?". The Guardian. Retrieved 14 July 2013. 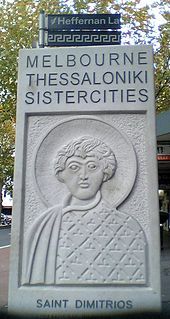 ^ "Sister City" (PDF). Archived (PDF) from the original on 15 May 2017. Retrieved 15 May 2017. ^ "What is the difference between a Sister City and a Friendship City? | AustinTexas.gov - The Official Website of the City of Austin". austintexas.gov. Retrieved 18 January 2018. ^ "Lords Hansard text for 26 Mar 2014 (pt 0001)". Retrieved 26 April 2016. ^ "Five key lessons for city competitiveness". World Economic Forum. Archived from the original on 19 October 2014. Retrieved 26 April 2016. ^ Lelièvre, Jean; Balavoine, Maurice (1994). Le Mans-Paderborn, 836–1994: dans l'Europe, une amitié séculaire, un sillage de lumière (in French). Le Mans: M. Balavoine. pp. 1–42. Retrieved 9 August 2013. ^ a b c "Town twinning in the UK and Germany". 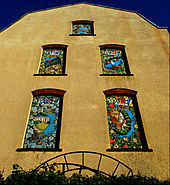 East Street Arts. Retrieved 29 July 2013. ^ "Keighley celebrates twin town jubilee". Telegraph & Argus. Newsquest Media Group. 2002. Retrieved 5 January 2009. ^ "Ghajnsielem.com – Twinning". www.ghajnsielem.com. Archived from the original on 24 January 2013. Retrieved 10 October 2009. ^ a b Furmankiewicz, Marek (21 March 2004). "Town-twinning as a factor generating international flows of goods and people" (PDF). Institute of Geography and Regional Development, University of Wrocław, Poland. Archived from the original (PDF) on 29 July 2013. Retrieved 29 July 2013. ^ "Coventry—Twin towns and cities". Coventry City Council. Archived from the original on 14 April 2013. Retrieved 6 August 2013. ^ "Disney seeks UK twin". www.ukprwire.com. Retrieved 30 October 2009. ^ "Bath Alkmaar Twinning Association | ORIGINS". www.bath-alkmaar.eu. Retrieved 23 June 2017. ^ "Twinnings". Twinning.org. Retrieved 16 June 2009. 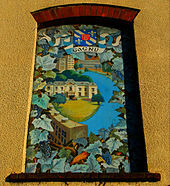 ^ "Murals for Sutton twin towns to get new lease of life". Sutton Guardian. 12 June 2011. Retrieved 10 September 2014. "Murals for Sutton twin towns to get new lease of life". London News. 12 June 2011. Archived from the original on 11 September 2014. Retrieved 10 September 2014. ^ "Revealing Sutton's twinning heritage 06.06.11: A set of murals celebrating Sutton's links with its continental twin towns is to be given a new lease of life" (Press release). London Borough of Sutton press office. 6 June 2011. Archived from the original on 25 August 2014. Retrieved 10 September 2014. ^ a b Kaltenbrunner, Andreas; Aragon, Pablo; Laniado, David; Volkovich, Yana (16 February 2013). "Not all paths lead to Rome: Analysing the network of sister cities". arXiv:1301.6900 [cs.SI]. ^ LeVeille, David. "A Tale of Dull and Boring Sister Cities". The World.org. Retrieved 15 July 2013. ^ "Boring in Oregon votes to pair with Dull in Perthshire". BBC News. Retrieved 26 April 2016. ^ Gambino, Lauren. "Dull and Boring? Sounds exciting". KVAL. Archived from the original on 22 October 2013. Retrieved 22 February 2013. ^ unknown (27 February 2014). "How Bristol could become the New Orleans of the UK". Bristol Post. Archived from the original on 19 August 2014. Retrieved 17 August 2014. ^ "Pancake Race 2007". Archived from the original on 6 February 2010. Retrieved 26 April 2016. ^ "Greek twinnings" (PDF). Central Union of Municipalities & Communities of Greece. Retrieved 25 August 2013. ^ Alexander Martin. "Tokyo Governor Seeks Better Ties With Seoul". WSJ. Retrieved 26 April 2016. ^ "APA – Gyöngyös city of Hungary fraternize with Azerbaijan's occupied town of Shusha – PHOTOSESSION". Retrieved 26 April 2016. ^ "Nablus twinning bid rejected". BBC News. Retrieved 26 April 2016. ^ Wang, Chuhan (22 February 2012). "Nanjing suspends official contact with Nagoya". CNTV. ^ Claire Bigg, Sister Cities Ramp Up Russia Boycott Over Antigay Law, Radio Free Europe/Radio Liberty (July 19, 2013). ^ Bajko, Matthew S. (15 August 2013). "Political Notebook: Cities asked to suspend ties with Russian counterparts". The Bay Area Reporter. Retrieved 27 August 2013. ^ "Prague suspends partnership with Russian cities". Prague Post. 2 September 2014. Archived from the original on 12 September 2014. Retrieved 12 September 2014. ^ Jacey Fortin, 'Comfort Women' Statue in San Francisco Leads a Japanese City to Cut Ties, New York Times (November 25, 2017). ^ Adam Taylor, Osaka mayor to end sister city status with San Francisco over 'comfort women' statue, Washington Post (November 25, 2017). ^ "Japan city mayor lodges protest over "comfort women" memorial cost". GlobalPost. Archived from the original on 4 March 2016. Retrieved 26 April 2016. "Twinnings for Tomorrow's World – A Practical Handbook" (PDF). Brussels: CEMR Council of European Municipalities and Regions. Archived from the original (PDF) on 13 May 2008. Retrieved 11 January 2010.